The Boston Celtics made only one move at this year’s trade deadline, dealing Jabari Bird and cash considerations to the Atlanta Hawks for a 2020 second-round pick. This means the Celtics have opened up a roster spot and will look to fill that void by signing an NBA player searching for their next destination. Two possible candidates are Markieff Morris and Enes Kanter. Morris was released by the Pelicans shortly after being traded out of Washington. Kanter, meanwhile, was released by the New York Knicks who failed to deal him prior to the trade deadline. 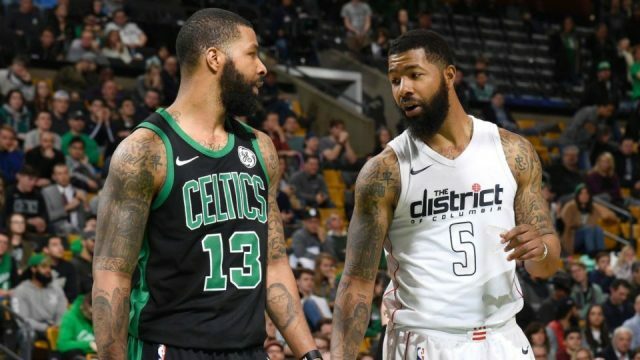 Should Danny Ainge pick up Markieff Morris, he wouldn’t be the first Morris twin on the squad. His brother Marcus is in his second season with Boston, having a career year. In 51 games, the Kansas product is averaging career-highs with 14.6 points, six boards, 47.6 from the field, and 41.1 percent from deep. He took to Twitter earlier today to let the world know how he feels about the Celtics and the chance they have of picking up his brother. Markieff Morris’ neck injury has kept him sidelined since late December, and it was announced on Jan. 3 that he would miss at least the next six weeks. This also wouldn’t be the first time that the two brothers have suited up beside each other in their NBA careers. For three seasons spanning over 2012-2014, the two played for the Phoenix Suns. Furthermore, the two attended the University of Kansas from 2008 to 2011. The 2014 season saw Markieff’s best days, where he had a career-high 15.3 points to go with 6.2 rebounds per game over 31.5 minutes. His production has since dropped off, and it’s unlikely to make a resurgence in Boston where he would come off the bench for a team that is already extremely deep on the wings. That said, reuniting the two brothers would clearly be something that Marcus in support of, and it could provide for some chemistry inside a locker room that has seen its fair share of problems over the course of the season.